It’s our 3-year anniversary! Cleolinda joins us for this special (and long) episode to talk about Guillermo Del Toro’s new film, Crimson Peak. Crimson Peak: The Art of Darkness — the artbook that Del Toro promises goes into more details on the backstory. One last time before release. 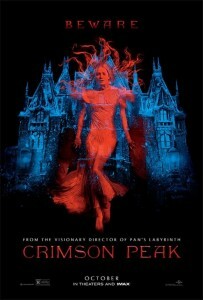 Crimson Peak: not a horror film. A Gothic Romance. Creepy, tense, but full of emotion… Like my dancing! Interview with Costume Designer Kate Hawley. Red’s review of Louisa May Alcott’s A Long Fatal Love Chase. Aromaleigh Cosmetics, for all of your Hannibal-inspired eyeshadow needs. SF Debris’ review of the Wonder Woman pilot. Okay, I will definitely be posting about Crimson Peak squee later on, but I have to say, Alina’s “Peter Parker is going to be the strongest magical girl” comment made me seal bark laugh out loud and scared my coworker.